Not too long ago Google announced Google+ comments for their blogging platform, Blogger. Recently, one of our readers asked us if there was a way to add Google+ comments in WordPress. 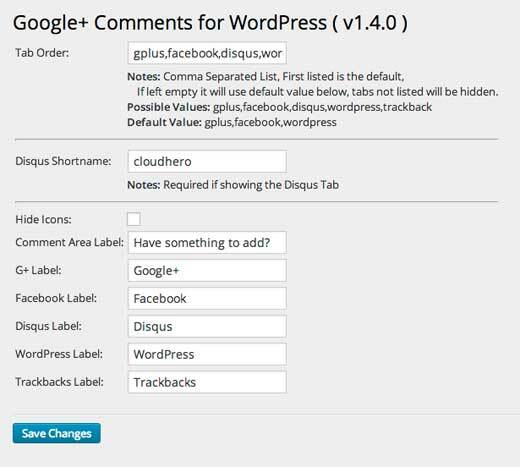 In this article, we will show you how to add Google+ comments in WordPress. We will also discuss the pros and cons of using Google+ comments on your site, so you can make an informed decision. Even though Facebook is still way ahead in number of active users, Google+ has a fairly large number of regular users as well. Many of these users are highly engaged in their circles. So whether you add Facebook comments to WordPress or Google+ comments, one obvious advantage is that you may see an increase in visibility. Often users have a tendency to share their comments publicly on their walls or timelines which means their friends will see your site. Another advantage is convenience. Since most people are already signed in with their Google+ account, they do not have to fill in their name or email. Some folks might find this more convenient. One of the biggest disadvantage of using Google+ comments is that right now there is no official Google plugin for WordPress. This means that some features like comment notifications are not available for WordPress users. What that means is that you would have to manually check all of your posts to see if there is a new comment unless ofcourse you were tagged in the comment. Since most Google+ comment plugins are unofficial, there is always that scare of when will Google shut it down? It is pretty unlikely, but it can happen. If it does happen, then you lose all of your comments. There are hundreds of WordPress plugins for other Google products, and they seem to be working fine for a long time. Last but not least, some people just aren’t comfortable logging in with their profile to leave a comment. They might want to remain anonymous. A solution to this problem is adding WordPress commenting system as an alternate option. 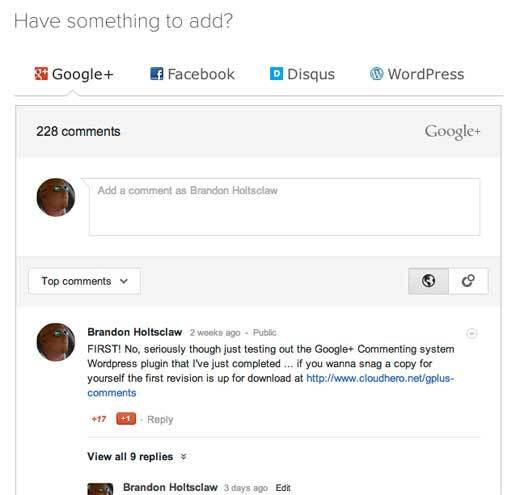 First thing you need to do is install and activate the Google+ Comments for WordPress plugin. Upon activation, the plugin adds two options under the Comments menu item in your WordPress admin. Go to Comments » G+ comments to configure the plugin. We hope that this article helped you add Google+ comments in WordPress. Before concluding this article, we feel obliged to let our readers know why we are not using Google+ comments on our site. We are not huge fans of third party commenting systems. We used LiveFyre on our site for a whole year, and ended up switching away. But just because third party commenting system is not a fit for our site does not mean that it doesn’t for others. Will you be adding Google+ Comments on your site? 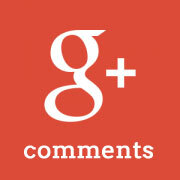 Let us know your thoughts on Google+ comments by leaving a comment below. Excellent plugin. This google plus comments plugin is really user-friendly. Thanks for sharing. Quick Update. Comments Evolved currently isn’t compatible with WordPress 3.9, and it appears the plugin is no longer supported by the author. Crossing my fingers for an Official Comment Plugin from Google. I’m not going to get it unless Google creates the plugin, just too much drama with that. I am with readers about disadvantages using google plus for comments, but we are also using others, so whats the issue ???? Is it possible to move to the Google+ comment system without losing Disqus comments on older posts? Is it good to add Facebook likes and Google +1s to a WordPress blog post. Just like that, adding comments from these two social services, is it good for SEO? Will there be an increase in traffic if I add this functionality? I’m not keen on installing an unofficial plugin, just to have it shut down later. But this post was very helpful and gave me answers to what I was looking for. Two thumbs up! Nice tutorial, but i am sticking with default WordPress Comments in WP Blogs and Default Blogger comments in Blogger powered blogs, considering the disadvantages of Google+ comments. In your opinion, which is better? G+ comment system or default WordPress comments? I prefer the default WordPress comment system. And then there’s another plugin that brings in your G+ RSS feed as a post, along with the comments. But, I think that one may actually break Google’s TOS, as it actually holds the comments on the site. Which TOS are you talking about? Kind of surprised that you didn’t mention the biggest downside IMO: lack of comment sync of any kind. You no longer own your comments, and if you ever turn off G+, all the comments go away too. In contrast, Disqus syncs both ways, for example. Also, enabling G+ comments means none of your existing comments will show up either. It’s a pretty poor solution right now. How would you contrast and compare WordPress Social Login to the above G+ one? Maybe I’m missing something as a newbie but it seems WSL covers all the social networks already and is much more streamlined. The difference is that WP Social Login allows users to login from their social profile, but the comments are posted using the WordPress native commenting system. This tutorial is actually showing a way to integrate Google+ comments with the +1 functionality, tagging, etc.